The Second Strike Casino Slot Game is an exciting slot comprised of 5 reels with 10 pay lines. It is produced by Quickspin. The icons are comprised of fruits such as plums, grapes, cherries, and watermelons. Then added to this are bells, stars, along with 7s and diamonds, and wild icons. You prepare to play Second Strike by first choosing your coin bet which can be between 0.10 to 100.00 coins. You can use the up and down arrow to change your bet. How much you can win is all going to depend on how much you bet. Many that have played this game suggest placing at least a 1.00 bet to get a substantial win. The fruit symbol combinations return the lower payouts. To move into the higher rewards you want to aim for landing a collection of the other symbols such as the bells, stars, sevens and diamonds. What you really want to go after is the diamonds which pay out 100.00 for 5 of a kind. The wild symbol will act as a substitute for the other symbols. Where the real excitement begins is with the second strike feature. What happens here is each time you land a win the wheel marker lights up and moves around the reels. If it lands on the symbols that created the win then icons of the same type will be added randomly to the win, which in turn increases your win. ation. 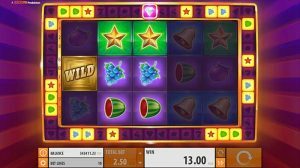 In the majority of other slots provided by Quickspin, the payouts are usually around 10 to 15x for a premium combination. The big potential here is with the Second Strike as the name suggests. If you trigger the second strike with a 3 of a kind combination then the feature will add 6 more symbols. If it’s a 4 combination that you landed then the feature adds 8 symbols. Then for a 5 of kind combination the feature is going to give you 10 extra symbols which mean all of the reels will be filled with that one icon.That would mean that you are going to collect on 10-5 of a kind combinations. How big of a payout this would be would depend on the icons in play. The ultimate hit here would be to get this 10-5 of a kind combinations with the highest paying icon. The Second Strike Slot game doe does not offer a free spins feature.